Mobile workforce management software has become a critical success factor for small business. If your company has employees on the go, you must have mobile WFM to be competitive. It’s that simple. If you aren’t using mobile WFM to manage your remote and mobile employees, you are already behind. It’s no secret that our modern business ecosystem is mobile. Smartphones, tablets, and watches make it easy to connect and stay in touch. Low prices and social ubiquity mean our workforce has come to depend on mobile access. Your work environment is no exception. Employees are more mobile than they used to be. Companies rely on mobile tech to keep everyone connected. Successful companies realize the advantages of keeping mobile employees engaged and communicating. At this point, it is a virtual certainty that every company relies on a mobile solution. While every company is using mobile for something, not all are using it for mobile WFM. Some companies are late to the game. Mobile devices are a resource that makes workforce management easier and more productive. With the right mobile workforce management software, you can leverage mobile and optimize. Mobile WFM is here for the using, and it’ll make managing employees a lot easier. It’s time to start using mobile workforce management software to manage your employees. Period. What Is A Mobile Employee And What Do They Need? You may not realize you have a mobile workforce. Recognizing you have a mobile workforce is a first step in defining mobile WFM solutions. 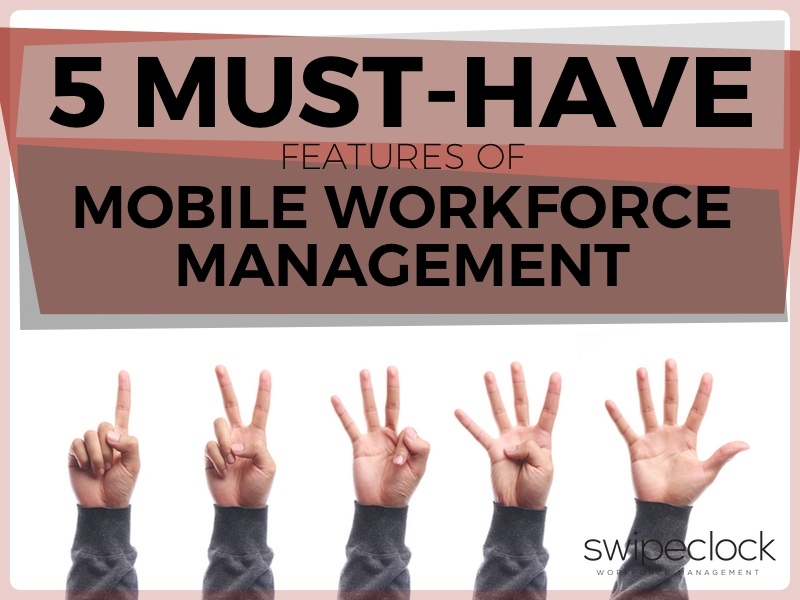 Here are a few examples of mobile employees and some reasons why mobile WFM is necessary. Sales positions are the obvious example. If you have sales representatives on the road; you are mobile. There are many types of a mobile sales rep. The primary attribute they share is visiting customers in person. For road-warriors, you’ll want to provide remote punch-in and punch-out. It’s also important to allow interactions with scheduling and self-service. You don’t want to tie your sales reps to a desk when they need to be on the road. Service techs are also in your road warrior group. These are employees who travel to customer locations to install or service on-site. These include cable repair, yard care, appliance or A/C maintenance workers. You’ll need to provide these mobile employees with time and attendance tracking. They’ll also need access to self-service portals, virtual swap boards, and overtime alerts. The more features you can provide in a mobile WFM solution, the more time they can spend on the job. Sometimes mobile doesn’t mean “on the go.” It can mean that the employee works at a consistent remote location. A good example of this would be a construction worker. Construction workers clock in at the same location every day for months or years. The construction site is a temporary work location compared to the corporate office. Mobile workforce management software can keep off-site employees connected. Off-site employees need time tracking. They also need scheduling and access to management. Managers will need to be able to manage larger groups of employees, also from off-site. Some employees float from location to location to fill shifts. For example, you may have a network of elderly care centers. Nurses and other caretakers may float from one location to another fill shifts. Compliance requirements may force you to share a nurse between several locations. To complicate this mobile workforce, you may have ’round-the-clock shift schedules. Scheduling employees at various places, and differing times is complex. Mobile workforce management software can help reduce complexity and improve efficiency. Finally, you may have employees that telecommute or who work at random locations. A few examples would include home office workers and trade show staff. Restaurants can have employees work remote locations in a food truck. Even staffing might have a temporary crew working a three-day festival. The point is; there are many types of mobile workforce. You may not consider your entire workforce to be mobile, but you may have mobile employees. There are many features you need in a mobile workforce management software solution. The more robust your solution, the more you can get done without connecting to a desktop. Mobile WFM can also be too complex. Complexity adds confusion and cumbersome requirements. Keep it simple, and start with the basic necessities to make sure you have a viable solution. You shouldn’t take it for granted that your mobile WFM includes mobile time tracking. As intuitive as this sounds, some mobile workforce management software forgets this feature. Clock-in and clock-out are at the heart of mobile WFM. Without it, you are missing the primary interaction with your employees. There would be little reason for mobile workforce management software without it. Time tracking is also the foundation of several other important features. Intelligent clock features help reduce clocking errors. Make sure your time tracker has an intelligent clock. Intelligent clocks reinforce correct clocking, so employees don’t check the wrong box. These time-savers are worth their weight in payroll. GPS location management helps confirm that the employee is where they say they are when the clock in. GPS location management can help you avoid expensive buddy-punching problems. It also helps assure you have the right resources at the right location. Job order tracking is part of time tracking, too. Job order tracking helps establish from which budget to withdraw the allocated labor. This can be a big help in budget planning and job management. Make sure your workforce management software includes time tracking. It is the number one reason to use it. Mobile scheduling is a big deal for companies with a lot of mobile employees. The fewer times each employee has to visit a terminal, the more time you will save. This goes double for complicated scheduling processes. Mobile scheduling allows your employees to check on their schedule from their smartphone. They don’t need to visit a specific terminal or call in. This will help free up management time and gives employees freedom and empowerment. Scheduling should allow managers to create schedules from templates to save time. Your mobile WFM software should alert employees to schedule changes. It should also let employees submit scheduling modifications such as time off requests. Scheduling goes hand-in-hand with time tracking and is an essential feature of mobile WFM. Speaking of employee empowerment, your mobile WFM software should include a virtual swap board. A virtual swap board takes a lot of work away from managers. it also allows employees extra freedom in managing their own schedules. Virtual trade boards allow employees to post shifts they don’t want. They can also volunteer for extra shifts that become available. Managers keep the ability to oversee and approve all shift trades. This is all done in a mobile employee self-service portal. Employees help reduce manager workload and fill empty gaps in the schedule. Managers always have control to watch and approve changes, and the system watches for unplanned overtime. In the event of unplanned overtime, your manager should receive an alert. Alerts help your managers keep the workforce running. They also help you avoid costly overtime expenses. Automated overtime alerts will help your managers avoid scheduling employees for too much time. Warnings will help managers spot missing gaps in the schedule, too. Both of these problems can cause havoc with tight budgets. Alerts keep your budget safe and your workforce running in compliance. Don’t forget that managers are mobile, too. We always think about how mobile workforce management software can help the employee. But it can be helpful to managers, too. Mobile workforce management software can help mobile managers keep an eye on the business while they are remote. Alerts warn managers when unplanned overtime might be a problem. They can also alert a manager to virtual trade board requests. Communication is key when managers and employees are working mobile. Mobile WFM should help keep managers working efficiently with comprehensive oversight. SwipeClock WorkforceHUB includes mobile workforce management software. WorkforceHUB includes employee access to time and attendance, scheduling, and self-help tools. Managers will appreciate the advanced management tools in WorkforceHUB.